Canon’s basic model DSLR was launched in 2008. This page collects together assorted 1000D information from both before and after its announcement. It includes information about reviews, firmware updates and any product advisories that may be applicable. 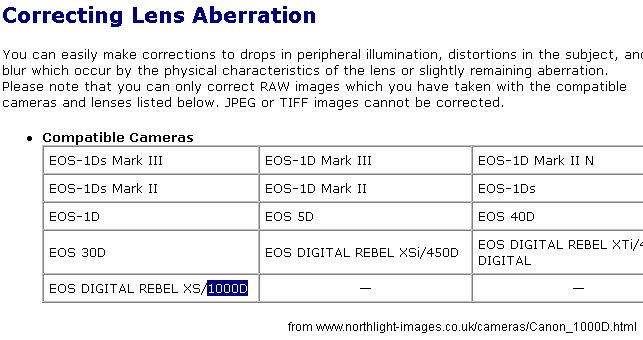 It is possible that the EOS digital SLR cameras which have had their main PCB replaced during the specific timeframes listed above may not turn on normally when Eye-Fi brand cards are used, or if any brand of SD card is removed from the camera within a certain time after opening the card slot cover. If the camera is not turning on normally when using an Eye-Fi brand card, a temporary workaround is to use SD cards instead of the Eye-Fi card when capturing images. If the camera is not operating normally when the SD card is promptly removed after opening the card slot cover, a temporary workaround is to remove the battery pack, then re-insert the battery pack. Fixes a rare phenomenon in which “Cannot create folder” is displayed on the camera’s LCD monitor, after which shooting is no longer possible with the SD card in your camera. Some cameras may exhibit a phenomenon in which the LCD monitor does not display, the shutter does not release, and the busy indication remains lit in the viewfinder. The message, “Err 99 Shooting is not possible. Turn the power switch to <OFF> and <ON> again or re-install the battery”, appears on the camera’s LCD monitor, and after the above operation is carried out, the LCD monitor displays in a language that is different from the actual language setting. Firmware Version 1.0.5 incorporates the following improvements. Supports the AF assist beam feature of the new flash, Speedlite 270 EX, which is scheduled to be released in April 2009. New Offer – started 15th September, ends 12th January 2009. Extended Offer – started 26th June, ends 12th January 2009. Extended Offer – started 21st August, ends 12th January 2009. July 30th UK price down to £400 (body), but the 450D is only £415 – expect the 1000D for £350 by the Autumn? Comes in black and silver – only with a lens. “Expected to ship in August 2008 the Canon Rebel XS camera is available in a zoom lens kit version, which includes the EF-S18-55mm f/3.5-5.6 IS zoom lens, a rechargeable battery pack and charger, USB and video cables, a neckstrap, an EOS Solutions Disk CD, and a 1-year Canon U.S.A., Inc. limited warranty. The new camera’s estimated retail price is $699.99. A 10.1 Megapixel CMOS sensor captures enough detail to make A4-size prints, even when cropping your image. Canon’s CMOS sensor technology also ensures crisp, sharp images even in low-light conditions. For dramatic mid-action shots, the EOS 1000D allows continuous shooting of large JPEG images at speeds of up to 3 frames per second, until the memory card is full. With a 2GB card, this lets you shoot up to 514 images without a pause. A wide-area Auto Focus system uses 7 separate focusing points to lock onto subjects fast. The central focus point enables focusing even under low-light or low-contrast conditions. Canon’s built-in dust prevention system guards images against the effects of dust in three ways: reducing dust generated inside the camera, shaking dust from the sensor each time the camera is turned on or off, and mapping stubborn dust spots for removal with the provided Digital Photo Professional software. In Live View mode, use the bright 2.5” LCD to frame and take shots from awkward angles. During playback, the LCD provides detailed review of shots, and features a wide viewing angle for easy sharing with friends. A large, bright viewfinder allows framing of subjects even in the brightest conditions. Canon’s cutting-edge DIGIC III processor – as used in professional EOS models – delivers rapid operation, accurate colour reproduction, fast start-up times, and low power consumption. Shooting to the popular SD/SDHC memory card formats, the EOS 1000D is ideal for those who already own SD-compatible devices. Take control over the look and feel of your images with easy to use Picture Style presets. Contrast, sharpness and saturation can be customized in-camera or with Canon’s comprehensive software suite, supplied with the EOS 1000D. The smallest and lightest Digital EOS model yet, the EOS 1000D weighs just 450g – and is ergonomically designed for comfortable handling. The EOS 1000D is compatible with the complete range of EF/EF-S lenses, Speedlite EX flash units and EOS system accessories. AF Lock Locked when shutter button is pressed half way in One Shot AF mode. Type Two types of colour space, sRGB and Adobe RGB. Live View Mode with selectable grid display. Photo Effects Monochrome (selected from the “Picture Style” menu) with options for Filters and Toning Effects. Self Timer Approx. 2 or 10 sec. Firmware Update Update possible by the user. Power Saving Power turns off after 30sec or 1, 2, 4, 8 or 15mins. ² Based on Canon’s standard testing conditions with default JPEG quality, ISO 100 and Standard Picture Style. Figures may vary depending on the subject, memory card brand and capacity, image recording quality, ISO speed, drive mode, Picture Style, Custom functions etc. LAKE SUCCESS, N.Y., July 8, 2008 – Canon U.S.A., Inc., a leader in digital imaging, today announced the introduction of the EOS Rebel XS, a new entry-level digital camera that affordably puts Canon SLR technology such as an Optical Imaged Stabilized lens and easy-to-use professional features into the hands of emerging photographers. Consumers looking to take their photography a step further and begin shooting with an SLR will find the transition easier than ever with Canon’s new Rebel XS digital SLR camera. From the parent photographing a little league game, to the tourist shooting a wondrous new city, the Canon Rebel XS camera makes photography easy for everyone. Canon has also introduced the latest model in the EX series of Speedlite flashes: the Canon Speedlite 430EX II. Ideal for a wide range of photographers from first-time digital SLR users to veteran photo enthusiasts, the new Canon EOS Rebel XS camera was designed to embody what customers have come to expect from the EOS Rebel series – a fast, non-intimidating, lightweight, easy-to-use camera that produces excellent images and starts emerging photographers off on the right foot. Immediately, photographers will take notice of the camera’s Optical Image Stabilized kit lens for crisp focus, compensating for camera shake from unsteady hands or a moving vehicle. The new Rebel model also incorporates Canon’s DIGIC III image processor, 10.1 megapixel CMOS sensor, Live View, Auto Lighting Optimizer, 7-point wide-area autofocus (AF) sensor and 3.0 frames per second continuous JPEG burst rate where the number of consecutive shots in a burst is only limited by the capacity of the flash memory card in the camerai. “We are proud to introduce the new EOS Rebel XS camera at a very exciting time in digital imaging. As consumers have fully embraced digital photography, with many consumers purchasing their second or third digital camera models, we see the Rebel XS as the bridge to help photographers cross over from the world of point-and-shoot cameras to digital SLR technology,” said Yuichi Ishizuka, senior vice president and general manager, Consumer Imaging Group, Canon U.S.A.
A first in Canon’s EOS line-up, the Rebel XS camera’s continuous JPEG burst rate allows users to continuously shoot a scene until the memory card is at capacity. This will be particularly helpful for new photographers looking to capture that perfect image of a moving subject. The Live View function allows users to frame and shoot images in real time via the camera’s 2.5 inch LCD screen, a great feature for users accustomed to framing shots via LCD monitors on point-and-shoot digital cameras. The Camera’s Auto Lighting Optimizer detects dark areas of an image and automatically adjusts brightness and contrast to ensure optimal image results. The Canon Rebel XS allows greater ease of use through large control buttons and easy-to-see operating panel indications such as ISO settings visible through the viewfinder and Canon Speedlite controls through the camera LCD menu. The Rebel XS incorporates an APS-C size (22.2 x 14.8 mm) CMOS sensor with 10.1 million pixel images and Canon’s exclusive high-performance DIGIC III image processor to help deliver high levels of imaging performance and responsiveness. It also has Canon’s exclusive EOS Integrated Cleaning System, which features both hardware and software-based dust removal technology. Additionally, weighing less than 1 lb./450 grams, this camera is the lightest body in the EOS digital series camera lineup. The EOS Rebel XS camera is compatible with Canon’s extensive lineup of more than 60 EF and EF-S lenses, including the Image Stabilizer-equipped EF-S18-55mm f/3.5-5.6 IS, which is included in the camera’s standard zoom lens kit package. 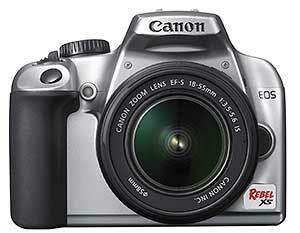 The Canon Rebel XS will be available in black or silver coloured body variations. The new Canon Speedlite 430EX II, which succeeds the 430EX, realizes an approximately 20 percent reduction in recycling time compared with its predecessor. Like the 580EX II, the 430EX II allows users to control flash functions and input settings using the camera’s LCD monitorii, and also offers a quick-lock attachment system and a metal mounting foot for improved contact reliability and durability. The new Canon Speedlite 430EX II will carry an estimated retail price of $329.99. Expected to ship in August 2008 the Canon Rebel XS camera is available in a zoom lens kit version, which includes the EF-S18-55mm f/3.5-5.6 IS zoom lens, a rechargeable battery pack and charger, USB and video cables, a neckstrap, an EOS Solutions Disk CD, and a 1-year Canon U.S.A., Inc. limited warranty. The new camera’s estimated retail price is $699.99. Though standard in the EOS Rebel XS kit, the EF-S 18-55mm f/3.5-5.6 IS lens is also available as a stand-alone purchase and carries an estimated retail price of $199.99. Canon U.S.A., Inc. delivers consumer, business-to-business, and industrial imaging solutions. Its parent company, Canon Inc. (NYSE:CAJ), a top patent holder of technology, ranked third overall in the U.S. in 2007†, with global revenues of $39.3 billion, is listed as one of Fortune’s Most Admired Companies in America and is on the 2007 BusinessWeek list of “Top 100 Brands.” To keep apprised of the latest news from Canon U.S.A., sign up for the Company’s RSS news feed by visiting www.usa.canon.com/pressroom. 9th Is the 1000D out tomorrow? A Spanish dealer site certainly thinks so and is running the advert to the right. Its’s not currently linked to anything though. 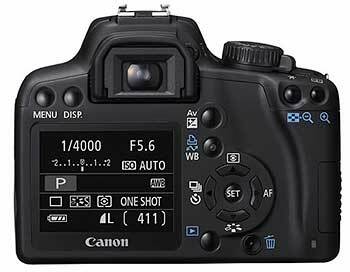 May 27th I’m told (thanks) that the 350D is no longer listed on the Canon UK site. A French site is claiming that Canon are starting to push the date with cryptic announcements. Re-live those memories in the Rumour archive starting on the 29th July 2006, where people were eagerly waiting for a 1Ds3, 3D and 5D2 … we got the 400D, is this the build up for the 1000D/XS? Bob Atkins says that a 1000D was mentioned to him a while ago, but with no info. 13th So now we have a 12MP 450D, what’s next in the numbering scheme? A new low end DSLR? The EOS 1000D? I’ve just looked at the Mac version V3.4.1 and have not found anything yet. Anyone looked in the Windows version, and was there a V3.4 at all? If Canon’s film camera numbering scheme is anything to go by, then a 1000D would be an entry level camera.